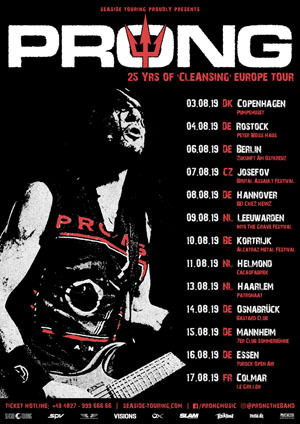 PRONG will celebrate the 25 anniversary of it’s album Cleansing with a limited series of intimate dates, as well as festival shows in August in Europe. For this run the band will consist of founding member Tommy Victor, bassist Jason Christopher, and drummer Art Cruz. The band will delve deep into material off of Cleansing, as well as Beg to Differ, and has some surprises in store as well. For the first time in PRONG history, a very limited amount of VIP upgrades will be available. Go to prongmusic.com to find out more.